Please send an e-mail in English (we cannot process technical support questions on any other language) to technical support. CardWare version exactly as it appears in the README.TXT located in CardWare installation directory (default: C:\Program Files\APSoft\CardWare). Where and when did you bought your version, your serial number. If problem is related with particular card please specify the card name and manufacturer exactly as it appears on the card. If you have troubles with card drivers please specify an exact driver version and URL where you got the driver. In order to help you collect technical information about your computer, APSoft designed a specialized PC analyzer: the PCScope. Attention! You will need Administrator rights in order to launch PCScope. If you are working on computer where CardWare 7.0 is installed, please click here to execute PCScope for x86 platform and here to execute PCScope for x64 platform. From following dialog, please select "Open" option. Please be patient. The PCScope size is approximately 2.8 MB. We also recommend you to minimize all windows on your screen since PCScope dialogs may appear behind of active application windows. After PCScope is started, please follow instructions on the screen. By end of the execution, PCScope will create file C:\CWSUPRT.REP in root of your disk C:\. Please attach this file to your support request. 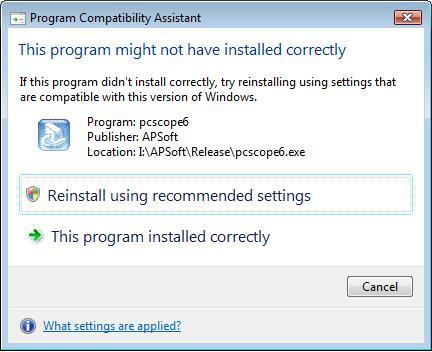 Please ignore above message and simply click on "This program installed correctly"
If you encounter problem executing PCScope, alternatively, you can collect required technical info manually as described in following section. If you created and attached CWSUPRT.REP to your e-mail, please ignore following section. Change to the key. Then select command "Save Subtree As..." (not Save!) from Registry menu, create a text file (e.g. pcmcia.txt, pci.txt, cwmem2k.txt, pccs.txt, pcmcia.txt, multif.txt, class.txt accordingly) and provide these files with your e-mail as an attachment. Please, find in your installation directory (e.g. C:\Program Files\APSoft\CardWare) CW2KKRNL.LOG, CW2KKRNL.OLD, CW7.LOG and CW7.OLD files (if they are exist) and provide these files with your e-mail as an attachment. Please insert any 16-bit (non-CardBus) card in the socket, execute DOSCARD /A command, redirect output to the file and include this file with your mail as an attachment. If you have problem with ATA, FLASH or SRAM card, please insert the card in the socket 0, execute PCDISK /DI:0 command and PCDISK /CI:0 command, redirect output to files and include those files with your mail as an attachment. Attention! Do not include text of required files in your e-mail. All support files should be attached. We will not process support requests without files listed above or with content of such files included into e-mail text.